The earthquake of 8th October 2005 devastated large swathes of the border regions of Jammu and Kashmir. In Kashmir, the Uri area of Baramulla district and the Tangdhar area of Kupwara district were flattened, with large scale loss of life and destruction of housing stock. Care Today set up the Comfort Kashmir Fund in the immediate aftermath of the earthquake. We received contributions of Rs. 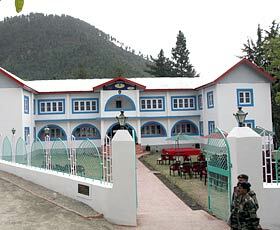 62.13 lakhs for this, and have made grants of Rs. 56.52 lakhs so far. Care Today partnered with the Border Roads Organisation (BRO), whose Beacon Project is in the business of building and maintaining key roads in the state, to provide immediate relief in the form of material for temporary shelters to 58 families who lost their earning members in the earthquake. We spent Rs. 4.2 lakhs for this. In the medium term, we set up two schemes for the worst affected sections of the community. The first was a monthly payment to the guardians of children who had lost a parent in the earthquake, in which a sum of Rs. 7.28 lakhs was administered by SOS Children's Villages of India. The second was a grant to the widows of labourers from the state of Jharkhand who had died in the earthquake, for which a sum of Rs. 2.03 lakhs was administered directly by Care Today in Jharkhand. We also worked with the Indian Army to build a hostel for students in the remote border region of Tangdhar, and made a grant of Rs. 43 lakhs for this purpose. 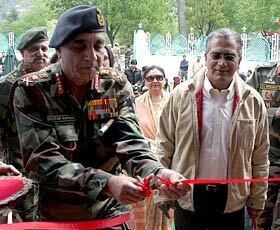 The Students' Hostel was inaugurated by the Chief of Army Staff Gen. Deepak Kapoor and Editor-in-Chief of the India Today Group Mr. Aroon Purie on 9th May 2008. Shelter material to 68 families Support to orphaned children. Financial grant to four widows of labour Construction of a student hostel in Tangdhar.